Actress & Girl is a two-woman play created and performed by two young theatre-makers in South Africa, produced by Masidlale Productions[i]. This brief writing seeks to comment on the process through which the particular work came about, tracking influences from Jerzy Grotowskibs theatre practice and Eugenio Barbabs philosophy in the South African theatre landscape. The part of this landscape in question constitutes the devised theatre most notably coined by Percy Mtwa, Mbongeni Ngema and Barney Simon, as well as Gha-Makhulu Diniso and specifically the palimpsest they form in pseudo-collaboration[ii] with Samuel Beckettbs Waiting for Godot. Driven by this curiosity, it seems that the legacy of Beckettbs famous play permeates the South African theatre industrybs psyche in various ways, be it content or form. Often, adaptations of European works are reinterpreted and localised to our unique, African landscape - most often the Karoo. To explore the qualities of copy and original, of rereading and reinterpretation, in the adaptive, localising technique I will affectionately call 'Karoo-nisation' it is helpful to introduce the case-study play and the environment it was birthed from/in. 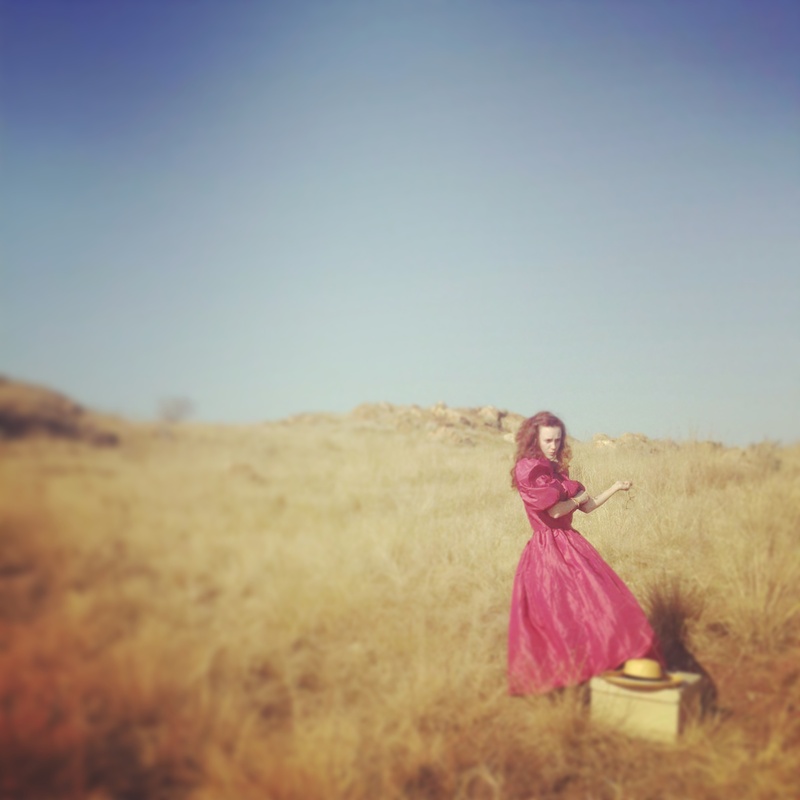 Actress & Girl premiered at the POPart Theatre in Maboneng, Johannesburg in October 2014; subsequently playing at the Musho! Festival in Durban in 2015. The Musho! Festival is one of the very few festivals in South Africa devoted entirely to the theatre form of the two-hander play. In 2015 they celebrated 10 years of championing the practice. Similarly, the South African theatre heritage we have as artists is filled with a style that might most closely resemble Grotowski's Poor Theatre. Mtwa et al call the South Africanised embodiment of it "townshipb style, bminimal facilities-b few lights, no fixed seats, no carpets... people come and go" (1983, i). There is a sense, as there is anywhere in the world, that if there is no hunger to challenge and break convention then we rinse and repeat the same performances. Woza Albert! (a powerful and relevant text) has been staged again and again since its heyday in the 80s and 90s - and some might argue that it has since become "dilutedb"because of it. Waiting for Godot exists in multiple versions too, adaptations, inspirations and applications. Yet, as posited by Clare Foster, "repetition... is a fundamental structure by which meaning is made... something has to occur again in order to occur at all" (2013: 1). As humans, as theatre artists, we create transient work that disappears as it exists. The liveness of the medium is its passing. In a way, what passes through time is not us as creators but the creation itself, re-visioned and revised as time wheels on[iii]. The creators might then be seen more as ghosts on the margins if anything at all, in the mist, agents of production and reproduction, of survival. Darryl Accone, in an introduction to a collection of Gha-Makhulu Dinisobs plays says, "it is, after all, the imperative of the artist to survive... he or she will yet outlive society's ephemeral power. Indeed, the plays collected here will outlive the public..." (2009: 6). If the work (the performance) is the body, and existence, of the actor then that existence is questionable when viewed through a critical lens that has its aperture tuned to the grandeur of universal time. A time that is less comprehendible in human terms and more like a chaotic, primordial soup. Foster concludes then that, "we need repetition in order to know who we are" (2013: 4). In this way I am not trying to defend continuous adaptations of previous work, such as Beckett, or claiming that doing so dilutes the original intent or efficacy; but rather seeking awareness that originality and copying (or repetition) are not clear-cut binaries. Instead, they are a yin-yang dynamo that operates at multiple points in space and time. Diniso"s "Theatre of the dispossessed", for example, which is similar to Matsemela Manaka's[iv] experimental work, is satirical (politicised) inquiry into the state of South Africa in the 1970s, "[his] plays function as a socio-political time-capsule" (Sichel, 2009: 7). His work sits within the basket of alternative, minimalist, South African physical theatre dominated by characterisations and commentary. Although, in truth, he is not easily classifiable into any succinct genre of theatre. The point I wish to make is that the content of Diniso's work was mostly autobiographical[v], but the form was a copy, an interpretation of the Poor Theatre of the industry. How shall we perform it? Minimal. Shall we speak? Yes, let's quote some plays. And that last line is perhaps the crux. What is said, as an extra layer, in overtly referencing other texts? Now it won't serve this paper to dive into a semiotic discussion on the philosophy of "text" and what constitutes "text" and its value in society. Suffice to say that although Actress & Girl worked with texts and even became its own, the way that the text was "written" lent itself towards the devising process. This process that is led by the body, by the performer, and not necessarily the words provided beforehand by the playwright. Script writing was the last thing on everybody's mind, "Simona [the director] joined us so it was a dual play/write process that morphed into a play/directed version, and then we wrote the script" (Neary, 2015: pers. comm., 28 March). The script came into being at the end, and even then is subject to change, as is the way of collaborative theatre. Eugenio Barba and his Odin teatret worked with the idea of a "Third Theatre", this is a theatre form that is "collective". As opposed to the First Theatre, which is commercialised and subsidised, and the Second Theatre, the avant-garde form that abandoned the actor for the director (Roose-Evans, 1970: 165). Even though there is a mighty emphasis on the spoken-word (text), I believe Actress & Girl can still be considered an example of Barba's Third Theatre because of the nature of its collective/collaborative process. Its script or text, for all its omniscience, is malleable too. The authority of it is like humus, or potting soil; the fertiliser to the work/art. What is important, what is valuable to us is not this (fundamental) dirt but the rich plants and flowers and food that surface from it. Neary claims, "we did a joint process of writing and performing - but ultimately we performed more" (pers. comm., 28 March). Both Neary and Sandham, as skilled and trained performers before anything else, approach their craft from the stage, as a performer-creator first. In one sense, this is one more ode or reference, to Grotowski's method. For Grotowski, "the actor is the high priest who creates the dramatic liturgy and, at the same time, guides the audience into the experience" (Roose-Evans, 1970: 147). The emphasis on the body of the performer as a guide to the experience of the play, of life, is grounded in the history - not only of European theatre - but historical performance, notably tradition and ritual practice from multiple societies and cultures. Once again, there is the sense that nothing is new, per se, but a digestion and regurgitation of the past. What is copy and what is original? One of the reviewers at the Musho! Festival says about Actress & Girl that, "there is something of the Scott Fitzgerald novel about the play too which catches my attention: hard beauty, with its perfect limbs, seen up close and trembling; a grand, dissolute, uncertainty; a forlorn abandonment; a repressed sensuousness, a rubbing of shoulders with famous writers - and so on". (Turner, 2015). In focusing on the "rubbing of shoulders with famous writers", Actress & Girl demonstrates an awareness of itself in a corpus of work, a compounding wheel of repeated curiosities in playmaking/writing. This self-reflection is one of the defining factors of the Absurd Theatre. In confronting themes such as abusive relationships, power struggles, loneliness, abandonment, the creators were aware that these kinds of universal issues are not new but copied. I believe there is nothing lost in being aware of the fact that what we create as artists and people is not new, but a (re)interpretation, a (re)reading; ultimately, a (re)newal. To renew is to restore, or replenish, to revive, to establish (Stevenson, 2010: 1504) It is a process of imbuing life, which in a sense, is the notion that it (we) will eventually die. To comment briefly on the notion of the absurd and absurd theatre. The term was coined by Martin Esslin circa 1961, in his post-war study of Beckett, Eugene Ionesco and Harold Pinter (Worthen, 2004: 907). He noted the disorientating quality of their plays; plays that often lacked discernible, easy-to-follow plot, development, characterisation etc. ; Absurd can mean ridiculous, or out-of-harmony, but in a theatrical context it is the virtue of purposeless that is most apt. The idea is that humans and their actions are senseless, useless and meaningless. Without delving too deeply into the existential waters of Absurdism, there is some insight on the myth of Sisyphus[vii] by the notable writer Albert Camus, "the absurd man, when he contemplates his torment, silences all the idols. In the universe suddenly restored to its silence, the myriad wondering little voices of the earth rise up"(1945: 5). What we are considering is that it is this moment of reflection, and awareness (as mentioned previously) that constitutes absurd performance. Melody Stander, another one of the reviewers for the Musho! Festival 2015, stated that bone could say that this [Actress & Girl] is a modern take on an all-female version of Waiting for Godotb. I agree with her statement but at the same time would like to suggest that as a "version" of Godot the work is unique. Given our discussions above, Actress & Girl is not so much a feminised, South Africanised (Karoo-nised) version of Beckett's Waiting for Godot, but rather an "original" copy of the quality of it. The qualities of absurdism: of stark staging, existential dialogue and focus-on-the-physical, are evident on a smaller scale and more bplayed withb in our version. Marcia Peschke, in her review, said, "there are some lovely elements of physical theatre used in expressing the desperate feelings of the characters that complement the absurd style of the play" (2015). There is no rebranding or avatar-like rebirth of Godot in this work, but merely a compliment; a tip of the hat, really. As for the direct quotations of play-texts in the piece; lines from Shakespeare's Othello and from Beckett, Neary suggests that, "the texts came through organically, we were aware of their influences from the get-go. Othello was from the point of view that the Actress would be influenced by it and attached to that play. Waiting for Godot came from the context of two characters alone, desolate, stuck on stage." Be it context or influence, a meta-awareness of the reference is a double-sided observation, for both the creators and the spectators sharing in the experience. "You can be lost at the same time as being found"
To reflect on concepts of the original and the copy, in the medium of live performance, has thus brought up questions of time, (re)cognition and the finite body. This brings us to a subtle finale, one that may or may not have been stated before. What space is this, that are we in; what time? In the late 1960s Michel Foucalt discussed the place of space, he queried the effectiveness of a structuralist point of view of the world. In a time before the internet, he seemed acutely aware of its imminent existence, "we are in the epoch of simultaneity: we are in the epoch of juxtaposition, the epoch of the near and far, of the side-by-side, of the dispersed" (1986: 22). In a globalised society where new technology and various media consume our leisures and workings in a web of intertextual counter-referencing (essentially hyperlink-ing), live performance is (and has been) a physical embodiment of repetition. Although the host is new, fresh, unique, the content they manifest is a reference to something past - perhaps it then becomes a question of how aware they are of it; how aware the audience sharing the experience is of it. Accone, D. 2009. "Introduction", in Kuyanuka and other plays: Gha-Makhulu Diniso. Botsotso Publishing: Braamfontein. Beckett, S. 1965. Waiting for Godot. Faber & Faber: London. Camus, A. 1955. The myth of Sisyphus and other essays. Knopf: New York. Esslin, M. 1987. The field of drama: How the signs of drama create meaning on stage & screen. Methuen Drama: London. Foucault, M. & Miskowiec, J. 1986. bOf other spacesb, Diacritics, vol.16, no.1, p22-27. Mtwa, P., Ngema, M. & Simon, B. 1983. Woza Albert!. Methuen Drama: London. Oddey, A. 1994. Devising theatre: a practical and theoretical handbook. Routledge: London. Sichel, A. 2009. "Introduction", in Ikasi and other plays: Gha-Makhulu Diniso. Botsotso Publishing: Braamfontein. Stevenson, A. (ed.) 2010. Oxford Dictionary of English. Oxford University Press: Oxford. Roose-Evans, J. 1970. Experimental theatre: From Stanislavsky to Peter Brook. Routledge: London. Worthen, W. B. 2004. "Martin Esslin, from The theatre of the absurd (1961)", in The Wadsworth Anthology of Drama. Wadsworth: Massachusetts. [i] An independent theatre company creating original South African theatre work since 2010. [ii] "Pseudo" because of the certain dialogue with Beckettbs work, without necessarily having bcollaboratedb directly with the artist. As is the temperament of most art. [v] Which is to say, he was informed, inspired by and referencing the society around him (and his place in it). [vi] One of the two performer-creators. For more on the concept of the Performer-creator, specifically in a South African context, please see Rob Murraybs MA thesis (2002): Towards the performer-creator in contemporary mime, with specific reference to the physical theatre of Andrew Buckland, 1988-2000. [vii] To make sure, this myth is (most simply and briefly) that of the man who rolls a boulder up the side of a mountain all his life, only to watch it roll down again, and to repeat the process; endlessly. Tristan Jacobs holds an M.A. 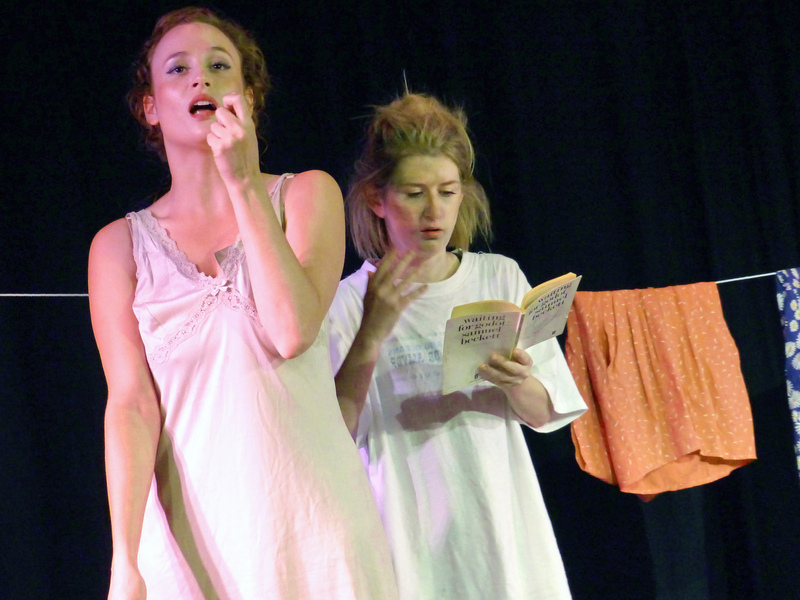 in contemporary performance as well as an Honours degree specialising in Acting, Writing and Dramatic Literature. His varied research has been published in the South African Theatre Journal, TYA Culture & Society as well as presented in Cape Town, Johannesburg, Helsinki and Malmö. He is artistic director for Masidlale Productions and currently a lecturer-researcher at the AFDA Film School in Johannesburg.